According to one possible interpretation, this sculpture of Buddha seated in meditation (samadhi) on the naga Mucilinda depicts an episode from the life of Sakyamuni. The latter, plunged in meditation, was about to be swallowed up by the waters of a lake when Mucilinda, who dwelt in the lake, protected him with her multiple heads, shown here above the Buddha figure. The Enlightened One appears to sit enthroned on the serpent’s coiled body. With its hieratic pose inherited from 10th century styles, and its lavish finery, the statue is typical of the Angkor Vat style. The broad face is square-shaped, displaying an unnatural morphology and stylized modelling; the facial mask is bisected by the sharp, unbroken arching line of the eyebrows. 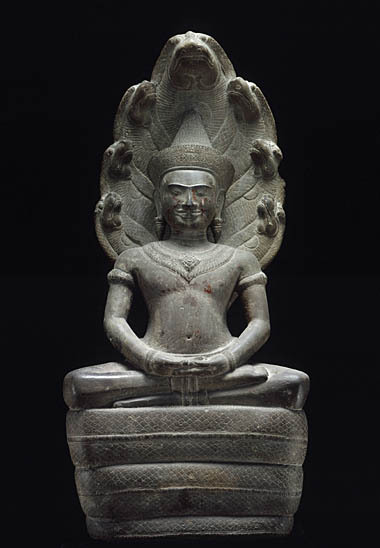 This representation of the Buddha protected by the naga is an archetypal Cambodian image which, according to our present state of knowledge, emerged in the early 10th century and later became a choice theme in Angkorian statuary. The theme held, moreover, particular significance in Cambodia where the naga was linked to the foundation myths of the Khmer kingdom. Sporadic traces of lacquer are visible and these are believed to date from a later period. A revival of 10th century hieratic statuary styles took place under the reign of the great conqueror and builder King Suryavarman II (1113-c.1145), and the finest of all the Khmer temples, Angkor Vat, was erected under his patronage. In the early 12th century, although Brahmanism was still the dominant faith, more and more Buddhist representations were appearing, indicating the growing importance of Buddhism at this period. However, it was not until the latter half of the 12th century that it became the official state religion.